Everyone is invited to attend. We ask each Neighborhood Council to select at least one Resilience Liaison to attend and represent your NC if you haven’t already. This event is open to all NC board members and stakeholder members. 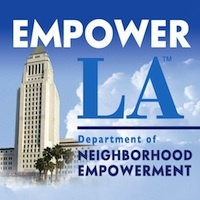 Please see link for more information on Resilient Los Angeles at https://www.lamayor.org/Resilience. There will be two presentations. First, a presentation will be done, and then discussion on the draft template that will be used to help Neighborhood Counils create their Disaster and Resilience Plans. Please see link: Second, Captain Cody Weireter from the LAFD will do a presentation on CERT (Community Emergency Response Team). Later this year, the LAFD will offer a free CERT training for Resilient Liaisons who have not taken the class. Parking: Parking pass and information for parking will be sent to you after you RSVP. It must be printed out and then presented to the person at the kiosk at City Hall East when you arrive.